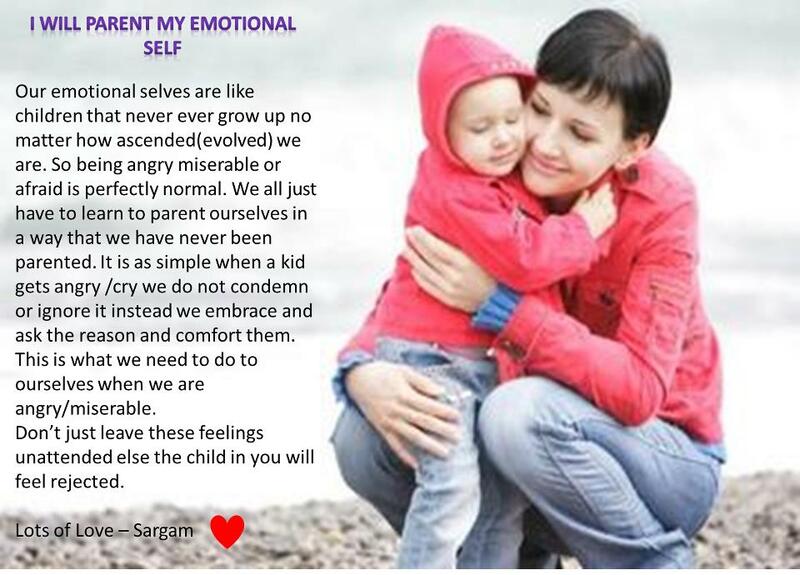 Our emotional selves are like children that never ever grow up no matter how ascended(evolved) we are. We all just have to learn to parent ourselves in a way that we have never been parented. It is as simple like this..when a kid gets angry we do not condemn him instead we embrace them this is what we need to do to ourselves when we are angry/miserable. Anger is just like a red flag that there are unresolved issues that need to be addressed with love and approval within ourselves. This emotion has to be treated by YOU just like a kid who has no one in the room except YOU to help out. Society has conditioned us in a way that if something is going wrong we should either hide it or push ourselves harder to overcome it but this is worse to go somewhere. How hard can you try with people/situations/relationships where you do not have control? You don’t have to try hard to please them and make it work instead you have to just love and approve for all the fear that you have within. Whenever you become aware of your negative thoughts and emotions, instead of ignoring them, or disapproving them, identify, acknowledge and honor them. Become very clear on what is upsetting you. Identify the exact thoughts that are creating the negative emotion. Are they self-judging, bad memories, or anxiety about future events? Aee these causing any dis-ease in the body? Is it insecurity or a fear of the unknown? Next, identify the specific emotions that arise in you as a result of these negative thoughts. What do they feel like? Is there tightening in your chest? Is your stomach being hurt or is there a throbbing sensation in your head? Try listen to your body. Once you’ve clearly identified the thought(s) and emotion(s), close your eyes and explore the imagery they subsequently create in your mind (once you’re familiar with the practice, you won’t always need to close your eyes—i.e., if you’re driving, or in public you can still do this.) Do the thoughts and emotions create colors, shapes, figures? Are they abstract or clear? The important thing is to let your thoughts and emotions create the imagery while you simply become aware of what they are. Breathe. We’re at the half way mark and I’d like to offer you sincere congratulations on completing the first half! Our natural tendency is to suppress these uncomfortable thoughts and emotions, often telling ourselves that we will deal with them later but honestly, that later never comes. Unfortunately for most of us, it never does. So even just by taking the time to become conscious of, and identify these unpleasant thoughts and emotions is a huge step! Let’s not stop there however, because here’s where the really good stuff starts to happen. Next, mentally (or verbally) say to the image that you know it’s there and you promise to care for and hold it with compassion until it’s ready to go. Do your best to say these words from a very sincere place in your heart. Through bringing our attention to the image of our painful thoughts and emotions, and tending to it with an open heart, we’re doing the most natural thing we can—expressing love. Instead of ostracize our uncomfortable thoughts and emotions accept and embrace them with love. The thoughts and emotions will often subside very quickly. Sometimes, however, they aren’t ready to go so fast, and that’s fine. When we initially tell them we’d be with them as long as they need us, we were sincere in that intention. So when the thoughts and emotions bother us, we honor and hold them dearly in our heart for as long as it takes.